Reusable water bottles have enjoyed a surge of popularity in the early 21st century, as more and more research becomes available about the disadvantages of bottled water. Reusable water bottles save you money on beverages and are more environmentally friendly than disposing bottles after one use; however, certain types of water bottles may contain BPA, which may be harmful to your health. Generally, reusable water bottles are made of copolyester, polycarbonate, polyethelene, polypropylene, steel and aluminum. There are a small number of manufacturers and retailers of glass reusable water bottles. 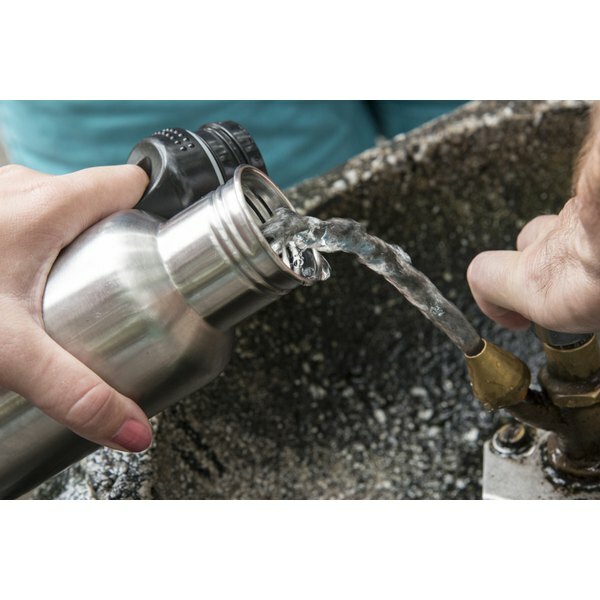 The most durable bottles are made of stainless steel and aluminum. BPA is a endocrine-disrupting chemical used to harden polycarbonate bottles and form protective lining in aluminum bottles. The National Toxicology Program in the United States reviewed the evidence and reported some concern about BPA's potential effects on the brain, behavior and prostate gland of fetuses, infants and children. NTP also had smaller concerns about BPA’s potential effect on mammary glands and early puberty. In response to public concern about these effects, manufacturers have developed BPA-free reusable water bottles. When you use a reusable water bottle, you help reduce the production of bottled beverages and therefore, the landfill and recycling burden of the bottles. In the United States in 2006, only 24.7 percent of plastic beverage bottles were recycled, according to the Container Recycling Institute, representing only 1.11 million tons recycled of the 4.47 million tons of bottles sold. In addition, aluminum and steel reusable bottles may be recyclable in your community if they are damaged beyond further use. In 2010, most reusable water bottles cost between $5 and $25. Buying and using a reusable water bottle filled with tap water instead of buying bottled water saves you money over the long term. In fact, Greeniacs.com reports that bottled water can cost up to 10,000 times as much per gallon as tap water. Reusable plastic water bottles can develop unpleasant tastes or odors over time. This may be due to plastic leaching or to the growth of mold or mildew in the container. Most odor and taste problems, reports outdoor equipment retailer REI, are due to storing bottles in damp areas or not letting them air out completely between uses. Clean your plastic water bottle with small amounts of bleach and baking soda, anti-bacterial mouthwash or vinegar, mixed with a full bottle of water. What Are the Causes of a Large Carbon Footprint?